You can feel confident when ordering with Dr.SkinAid® knowing that our site is 100% secure. All information you send through our website is encrypted in a way that makes it very difficult for someone to decode. We also implement several other security measures to maintain the safety of your personal information at all times. If you are still uncomfortable submitting your information over the web, we encourage you to order by phone, fax, or mail. You can find further contact information under our ‘Contact Us’ page. Your browser stores no information that will identify you. Dr.SkinAid® utilizes “cookies” and other technical measures which enable us to monitor traffic patterns and to serve you more efficiently if you revisit our public website. A cookie does not identify you personally or contain any other sensitive information about the User, but it does identify your computer. You can set your browser to notify you when you receive a cookie and this will provide you with an opportunity to either accept or reject it in each instance. The Dr.SkinAid® application service utilizes cookies for authentication and cookies will need to be enabled to use the application. Dr.SkinAid® will never sell or otherwise provide your personal information to any third party, or make any other use of your personal information for any purpose which is not incidental to the normal use of the Dr.SkinAid® website and services. Dr.SkinAid® sends billing information, product information, service updates and regular customer newsletters to registered Users via email. Where appropriate email communication will contain clear and obvious instructions describing how the User can opt to be removed from the mailing list. Dr.SkinAid® will immediately remove any User upon request. TheDr.SkinAid® website may contain links to third-party websites. 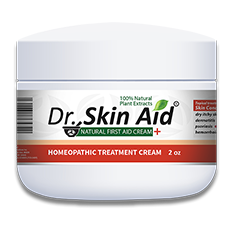 Dr.SkinAid® takes no responsibility for the privacy practices or content of these websites. Dr.SkinAid® reserves the right to change this policy at any time and any amended policy will be posted on this website and be effective from the time we post it. A healthy and safe form of topical medication. Dr. Skin Aid® is an effective trans-dermal delivery system that may help penetrate the skin to aid with the skin condition. We are confident that Dr. Skin Aid® may help you with your skin condition, therefore we are offering you 30 Day money back guarantee on every Dr. Skin Aid® purchased. Industry-standard 256-bit SSL-encrypted transactions means its 100% hacker safe. Overnight Shipping options are available.